Shade Projects is proud to present Ol' Blue Eyes Is Back, the solo exhibition of Fred Tieken and his return to Shade Gallery at the monOrchid. This exhibition will showcase Tieken’s latest artwork that highlights his interest in mixed media in addition to his colorful paintings that highlight shrewd observations, wry social commentary and smart symbolism, reminiscent of Basquiat. You can find the full press release HERE. The Artist Reception will be held Third Friday, February 20th from 6-10pm. The evening will include a brief talk from the artist about his work and process, as well as a book signing of his recently self-published book, Selected Works by Fred Tieken, a stunning 96-page, hardbound, full-color edition containing brilliant reproductions of 45 of the artist’s most popular Neo-Expressionist works, many of which now reside in private collections. 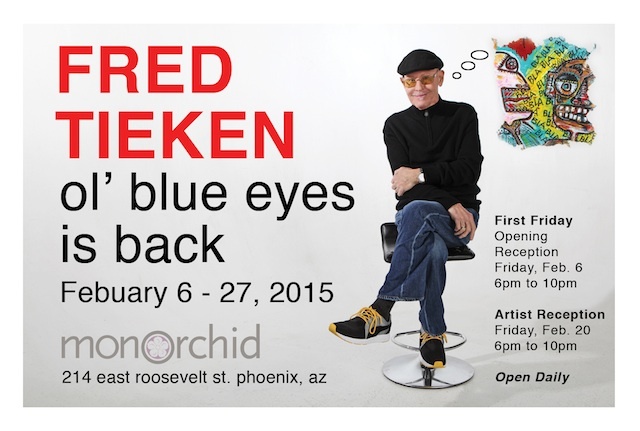 Ol’ Blue Eyes is Back will be on display in Shade Gallery at the monOrchid from February 6th until February 27th, 2015.